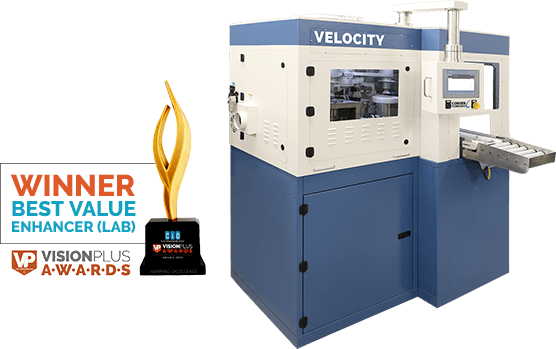 Coburn’s Velocity Spin Optical Lens Coater is a fully automated industrial hard coating system providing the highest throughput of any system on the market while also delivering excellent yields. The automation system includes a multi-stage pre-cleaning system as well as lens handling from the job tray, through a multi-stage lens pre-cleaning system, followed by a secondary cleaning system, coating, and cure, finally returning the lens to the job tray. All of this is accomplished without operator involvement. For those optical labs not yet ready to automate, Coburn can offer a manual version of the Velocity Lens Coater to take advantage of these key benefits.